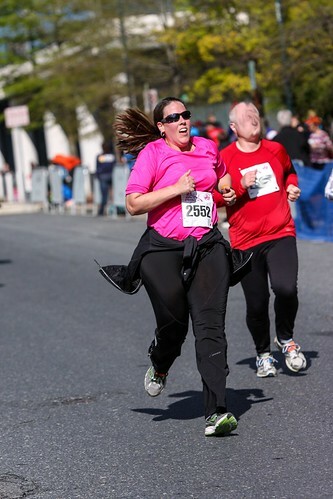 This photo was taken at a 10K race I ran in April. I did not share this photo then for obvious reasons. I share it now because I am kind of delighted by its awfulness and also because it sort of eloquently makes the point that sometimes in a fitness journey, you biff it. Over the past several months, I have very much biffed it. I went from running 4-5 times a week to running once every couple of weeks. I lost a huge chunk of my fitness base. I got so bogged down by pace and distance that I had to entirely ditch tracking my runs and wearing my Garmin for the indefinite future. I lost motivation and then I got sick and then I was out of the habit and then I got sick again and I got busy and then I just didn't feel like running and then I developed this cough that came with decreased lung capacity and all of a sudden, I wasn't a runner anymore. I'm clawing my way back though. I've been making an effort to get on the road or the treadmill every day and not feel bad if I walk instead of run. I've made peace with shorter mileage. I'm postponing the Big Running Goals I wanted to accomplish this fall and not beating myself up about it. My new mileage goal for the year is just to keep running. I'm going to finish out the year with no races longer than a 10K. I'm going to aim for a spring half marathon if I can find a good one. I'm going to sign up early for those big fall running events that I originally intended to do this year. I'm finally feeling inspired to be a runner again and I'm realizing that inspiration is what I was missing. I hope it is here to stay. * Disaster Strikes! Soda Edition: As long as I'm coming clean about my inactivity, I should let you know that even though I haven't mentioned it, I am a soda drinker again and have been for months and months. I know. It's shameful. Nah......I think you are a still a runner. You are inspiring me to find my motivation. I am no longer a walker and I need to get back to it. For the past two years I've been consistent about having 70-90k steps per week on the Fitbit but since wrapping up the Avon Walk in May I've had maybe a dozen days where I've got 10,000 steps. Training for those 39 miles was an overdose of walking and it has no appeal to me now whatsoever. I'm still being active, but I know getting the walking back in my routine is important. You are still a better runner than I. And touch my Fresca and I might kill you. Say what you will about your pose--which looks like a pretty standard mid-stride shot to me--but you're clearly carrying off a less awful look than the person to your right. At least your face hasn't melted clean off. Life is way too short to beat yourself over the head for failing to meet self-imposed goals. Occasional backsliding is part of the imperfection that makes us human, so I try not to get too worked up about it. The important thing is to resolve to be, in some small way, better tomorrow than you were today. Perhaps you didn't run one day, but you *were* a compassionate and caring friend to someone in need. Then you grew as a person emotionally, even if you didn't grow physically. Don't worry--you will address the running in your own time, and you will be a better runner, and a better person, a year from now than you are today. It's all good. Thanks to a complete dumbass who was "running late" and who rammed my car and flipped it, I haven't done any exercise in a year, and last week I had some of my spine taken out and replaced with titanium. You sure as hell look like a runner to me!!! I'm not even a walker at the mo. And the bits of me that aren't metallic are made of ice cream. I am glad you are back on run. Team MLC needs you in September, Captain Stimey! Don't beat yourself up over your break from running. That was Past Stimey's problem. Focus on all the awesome runs Current and Future Stimey have ahead. DIET COKE AND RUNNING RULE!!! Welcome back to the running! The beauty is, once you start running, you're a runner. Woot! You can totally do this. I'm sending you a virtual high five. And if you want a fun half marathon and want to try running on trails, I totally recommend the Virginia Happy Trails Running Club half marathon. It's just awesome. Info on their website. It's a fall half marathon. On a positive note, your foot placement looks perfect!! I hear your song loud and clear. When in Arizona, I walk 15 miles/week. Return to Ohio and the mileage is zilch. Ugh. BTW, can I presume that Claudia arrived safe and sound? Hey, you are still moving! That counts! And I can't quit Diet Coke, either. I crave my fountain beverages. Best of luck with staying moving!! Congrats on getting back at the running, and sticking with it long enough to feel good. Can you find a substitute for the soda? How about water with a squeeze of lemon or lime? Sparkling water with lemon, if it's the bubbles you like? Studies have shown that diet soda actually increases weight. When we needed to replace our old broken fridge, we got one with ice and filtered water in the door.What a difference that made to how much water we all drink. The ice made it way more appealing. Or brew some fruity herbal tea, and keep it cool in the fridge if it's flavour you need. Or, how about adding a dose of guilt- are you being a good nutritional role model for your kids? That one helps me. Just don't put cake in front of me. Sometimes you need a break after something huge like that. Starting back up is so hard, isn't it? And, yeah, bad things happened to that guy. Oh, that's really rough. I'm sorry to hear it. I hope your recovery goes well. But we do have something in common, which is ice cream parts. Yes, she made it here safely! way to go Stimey, you are badass. in that photo you look like you took on something that was hard and you pulled it off. story of life. If you do, I wish you a full recovery. I also hope that your insurance covers post-surgery physical therapy (PT), as it should. And occupational therapy, even if you just need a visit to figure out how to navigate your home safely. I am a huge fan of PT. Your orthopedic surgeon might even have a PT practice associated with their orthopedic practice. Also, recovering after surgery can take a long time. I was surprised about that, and I didn't have spine surgery. Best wishes for a full recovery! Jean, I'm trying to start walking more. If you're ever in my neighborhood and would like to grab coffee or tea and go for a walk, just let me know. There's a walk/bike path a block or so from the Whole Foods here. There's also a nice farmers' market on Saturday. Hope you and family have a great Summer! Primo and Secondo (our twins on the spectrum) are doing well and definitely have their quirk on. No rodents of any kind in our place, but we have become happy parents of a Boston Terrier. Gah - why is everyone so anti-soda all the time? Girl, drink that damn diet coke if you want to. Geez, it's not liquid heroin! I drink 64oz. of water a day and 2-3 sodas. And I love them. They are delicious. I'm also doing a couch to 5k program. It is terrible and wonderful - I don't want to be one of those people who never tries anything new, so I'm doing it. Race is Sept. 19th and I'm hoping to finish in under 45 minutes. Hope you and family are doing well.